We all know it is easy to get carried away with “decking the halls” during the holidays, and the concepts of excess, over indulgence and over scheduling come to mind this time of year more than ever. In general, there is a trend toward excess in our lives. It’s important to consider the messages this behavior sends to our children. When is enough, enough? For them, and for us? Are we spending a disproportionate amount of family income on any one category – i.e., clothing, entertainment, child enrichment (lessons, sports, etc.)? Are we spending a disproportionate amount of time and energy in any one or two activities? Sports, screen time, cell phones, social media? In his book, “The Intentional Family,” William Doherty warns that many families are over scheduled outside the family and under scheduled inside the family. As a parent, are you keeping your child from learning age-appropriate developmental tasks by doing things for them or taking care of things for them that they should be learning to do themselves? Examples include: picking up their own toys, doing their own laundry, paying for some things with their own money, learning to cook, etc. 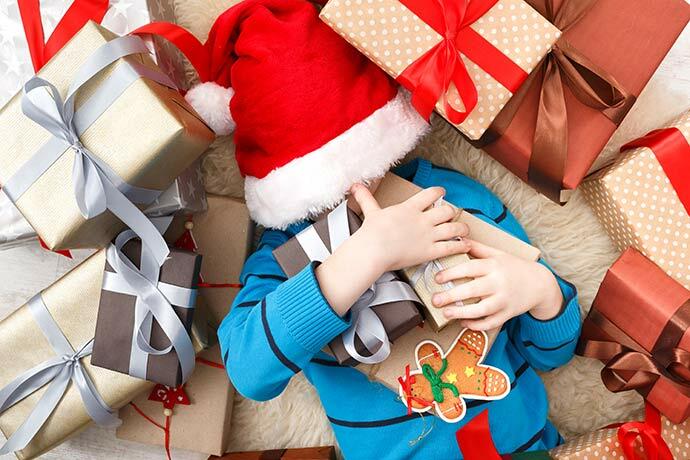 A few signs of over indulgence include: trouble learning to delay gratification; trouble giving up being the center of attention; trouble being competent in everyday life skills, including self-care and relationship skills; trouble taking personal responsibility – feeling like it’s always someone else’s fault; and trouble knowing what is normal. As a result of over indulgence, kids have come to regard overload as normal, and anything less is boring. In contrast to this is a term coming to the forefront called “creative deprivation.” Parents are coming to understand that kids can have too much of a good thing, so they place limitations on it. An example from an article in “The Tightwad Gazette” outlines this concept. On a recent trip to the mall, children ordered junior ice cream cones and consumed them in complete silence, savoring every bite. Many parents, seeing their children appreciate junior cones, would start buying them cones on every trip to the mall. Then, seeing their kids’ enthusiasm waning, would assume they must “wow” them with banana splits. When those no longer produced the desired effect, they would move up to the jumbo deluxe sundaes, and on and on, until the kids become impossible to please. When there is diminished appreciation, it is a sign that children have had too much of something. Instead of moving up to the banana splits, we need to, instead, decrease the frequency of the junior cone. We have habituated a certain level of expectation without appreciation. Another example of this is how frequently many of us go out to eat. It is no longer a treat, but becomes the norm. Limit things your kids don’t need, but do not limit the things they do need, such as good nutrition and parental attention. Provide them with creative alternatives to substitute for passive entertainment and “no brainer” play. Limit screen time, including cell phones, TV/video time and gaming. This will decrease the stimulation overload in their lives. Set boundaries, and provide rules and limits in all aspects of your child’s life. Maybe it is time for all of us – parents and children – to take a step back and evaluate. Are we needing increasingly more expensive gadgets, clothing, vacations, foods or other stimulating events to keep us happy? Creative deprivation may be just the ticket. Not only will it save money, but the simplification will also reduce stress levels, increase quality of life and set a good example for our children.